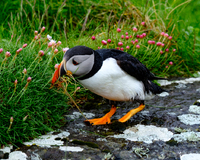 Excellent itinerary that included many remote islands; some, like St. Kilda, Lunga and Fair Isle are rarely visited by cruise ships. The food and service staff were both very good in The Restaurant and La Terrazza. We enjoyed one dinner in La Dame; food was excellent, the service was good and the more intimate ambience was appreciated. However, the surcharge of US$60 per person seems excessive, in my opinion. Silver Cloud&apos;s size is ideal for an expedition type cruise. Silversea did an excellent job with the recent renovation of the ship. The ship&apos;s interior decor is very tasteful, complimented by a superb collection of black and white photographs taken on early expeditions to the Antarctic, such as the one led by Sir Ernest Shackleton in 1914. The tasteful interior decor extends into the cabins, where warm wood trim compliments the neutral wall colours and the photographic prints from the Antarctic. Our Deluxe Veranda cabin was well fitted out. Our bed was extremely comfortable as were the pillows. Compared to other ships that we have cruised on, our Cabin #526 was the quietest one that we have ever slept in at sea. Our &apos;Butler&apos; Chokhoni was first class and she was ready to attend to all of our requests, always with a pleasant smile ! Without asking on our part, she even gave our shoes a polish ! This attention to detail was much appreciated ! The Expedition team, superbly led by Tim Amm, was well prepared and their lectures were informative and entertaining. Overall, I would say that the on board lectures were of better quality than any that I have heard aboard other ships, including the much touted ones by Adventure Canada. Getting in and out of the zodiacs was made easy and safe by a very dedicated crew who were always ready to assist passengers. These able crew members ensured that no one was injured, even during some challenging sea conditions. I would have no hesitation in highly recommending Silver Cloud Expedition, but with one caveat. Her tenders are in my opinion unseaworthy and and unfit for duty on the high seas. How Silversea can have these so-called ancient "lifeboats" aboard the Silver Cloud is beyond me. Why were they not replaced during Silver Cloud&apos;s recent US$45 million refit ? I have cruised on various expeditions to the high Arctic, Galapagos and Cape Horn, plus cruises on Oceania, Regent and Seabourn. I have never experienced such inadequate tenders on any ship ! If the Captain of the Silver Cloud ever had to order "abandon ship", it would become a calamity, unless the seas were flat calm. Silver Cloud&apos;s tenders each have a bow door that leaks water, plus two entry portals on each side, covered by tacky canvas covers. These entry portals, being very close to the waterline, would be breached by the first wave of water hitting the side of the tender. Sea water would eventually swamp the interior of the tender. Imagining 150 people stuffed into each of Silver Cloud&apos;s two tenders is unthinkable, especially in locations such as the Antarctic, crossing Drake Passage or mid-Atlantic ! In general, cruise lines tend to provide tenders with minimal seaworthiness. The ones on Silver Cloud are the worst of an already low standard set for life boats. Now that Royal Caribbean has bought out Silversea, perhaps they will pay close attention and replace the inadequate tenders aboard Silver Cloud ? Despite the issue with the tenders, we would have no hesitation in doing another cruise aboard Silver Cloud - she is such a comfortable ship with a very fine crew ! Silver Cloud anchored in Village Bay, St. Kilda. We were going ashore in a zodiac. This photo shows the sometimes challenging job that the crew does so well, getting passengers in and out of the zodiacs. Excellent itinerary that included many remote islands; some, like St. Kilda, Lunga and Fair Isle are rarely visited by cruise ships. The food and service staff were both very good in The Restaurant and La Terrazza. We enjoyed one dinner in La Dame; food was excellent, the service was good and the more intimate ambience was appreciated. However, the surcharge of US$60 per person seems excessive, in my opinion. Silver Cloud&apos;s size is ideal for an expedition type cruise. Silversea did an excellent job with the recent renovation of the ship. The ship&apos;s interior decor is very tasteful, complimented by a superb collection of black and white photographs taken on early expeditions to the Antarctic, such as the one led by Sir Ernest Shackleton in 1914. The tasteful interior decor extends into the cabins, where warm wood trim compliments the neutral wall colours and the photographic prints from the Antarctic. Our Deluxe Veranda cabin was well fitted out. Our bed was extremely comfortable as were the pillows. Compared to other ships that we have cruised on, our Cabin #526 was the quietest one that we have ever slept in at sea. Our &apos;Butler&apos; Chokhoni was first class and she was ready to attend to all of our requests, always with a pleasant smile ! Without asking on our part, she even gave our shoes a polish ! This attention to detail was much appreciated ! The Expedition team, superbly led by Tim Amm, was well prepared and their lectures were informative and entertaining. Overall, I would say that the on board lectures were of better quality than any that I have heard aboard other ships, including the much touted ones by Adventure Canada. Getting in and out of the zodiacs was made easy and safe by a very dedicated crew who were always ready to assist passengers. These able crew members ensured that no one was injured, even during some challenging sea conditions. I would have no hesitation in highly recommending Silver Cloud Expedition, but with one caveat. Her tenders are in my opinion unseaworthy and and unfit for duty on the high seas. How Silversea can have these so-called ancient "lifeboats" aboard the Silver Cloud is beyond me. Why were they not replaced during Silver Cloud&apos;s recent US$45 million refit ? I have cruised on various expeditions to the high Arctic, Galapagos and Cape Horn, plus cruises on Oceania, Regent and Seabourn. I have never experienced such inadequate tenders on any ship ! If the Captain of the Silver Cloud ever had to order "abandon ship", it would become a calamity, unless the seas were flat calm. Silver Cloud&apos;s tenders each have a bow door that leaks water, plus two entry portals on each side, covered by tacky canvas covers. These entry portals, being very close to the waterline, would be breached by the first wave of water hitting the side of the tender. Sea water would eventually swamp the interior of the tender. Imagining 150 people stuffed into each of Silver Cloud&apos;s two tenders is unthinkable, especially in locations such as the Antarctic, crossing Drake Passage or mid-Atlantic ! In general, cruise lines tend to provide tenders with minimal seaworthiness. The ones on Silver Cloud are the worst of an already low standard set for life boats. Now that Royal Caribbean has bought out Silversea, perhaps they will pay close attention and replace the inadequate tenders aboard Silver Cloud ? Despite the issue with the tenders, we would have no hesitation in doing another cruise aboard Silver Cloud - she is such a comfortable ship with a very fine crew ! Well equipped, quiet, very comfortable bed and tastefully decorated ! See further comments above.